Tuna Melts are some of the best comfort food around. They’re warm, skincare toasty and covered in melted cheese. I think melted cheese is the pinnacle of all things comfort food. Mac & Cheese, pizza, baked pasta, lasagna, etc, etc. And yummy, mayo-y, cheesy tuna melts. Instead of going the traditional route, I made these Southwestern by mixing the tuna with roasted poblano mayonnaise, black beans and pickled jalapenos. Smother in shredded Jack and Cheddar cheese and you’ve got a big ole’ Southwestern Tuna Melt that’s creamy, spicy and absolutely delicious. Tom went absolutely crazy for it and I’m sure my sister-in-law will be making it as soon as she sees it. She’s obsessed with all things tuna and southwestern. If I could choose one thing to eat every day, it might be this sandwich. It would probably be pizza, but it just might be this sandwich. It’s that tasty. Wish I had one right now! Begin by making the mayo. Place the poblano pepper and the mayonnaise in a small blender or food processor and blend until smooth. 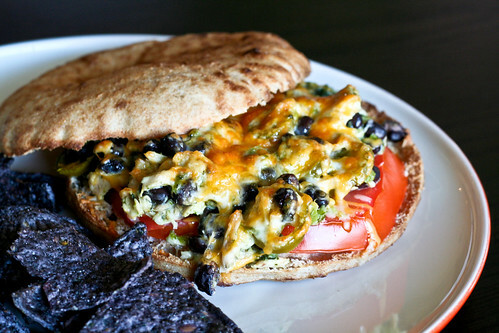 Combine the tuna, poblano mayo, black beans, jalapenos and salt in a bowl until evenly combined. Cut along the seem of the pita bread so that you’re left with a top and bottom (instead of a pocket). Place the bottom halves on a cookie sheet, then top them with the tomato slices and tuna. Place the pita tops on the cookie sheet alongside the sandwich bottoms. Sprinkle the cheese over the tuna and place under the broiler for 5 minutes, or until the cheese is melted and browned and the pita tops are toasted but not burned. Watch them while theyre under the broiler to make sure nothing burns. Remove from the oven, top with the pita top and serve with tortilla chips. *To roast a poblano, simply place it on the top-most rack in your oven under a pre-heated broiler. Use tongs to rotate the pepper often, about every minute or so. It’s done when the skin is blistered and charred all around, about 8 minutes. Remove with tongs to a paper bag. Seal the paper bag and wait 5 – 10 minutes, then peel the charred skin off and remove the stems and seeds. The spice factor of this melt sounds good. We could even lose the bread and scoop it up with those blue corn chips. Wow…what a way to jazz up canned tuna! Such beautiful colors too! Mel, this looks divine. Another reason why your blog has become my favorite food blog!